Abstract: This paper introduces the use of Same-Language-Subtitling (SLS), or Subtitled-Music-Video as a repeated reading exercise. The purpose of this study is to demonstrate the effectiveness of SLS related activities on Reading Engagement and Reading Proficiency. For the basic SLS exercise students repeatedly viewed brief excerpts of musical video with dynamic subtitles while completing matching cloze-style worksheets. In the advanced SLS activity students used Karafun, a karaoke program, to create and manipulate SLS projects for class presentation. Student attitude, engagement and reading proficiency levels improved during the course of this study. There is a need to develop further applications and lesson plans to take advantage of this learning resource. Same-Language Subtitling (SLS) is the practice of using high-quality text subtitling and video editing technologies (comparable to Karaoke) with music video and multi-media presentations as a repetitive reading resource. The visual format of SLS is very similar to Karaoke, where the captioning changes color in exact synchronization to the audio. Karaoke, however, normally uses secondary vocal models or fades the vocal model into the background. In SLS (as compared to Karaoke) the media is chosen for it's strong audio model and the original vocals are retained. When given high quality dynamic subtitling and strong dynamic vocal models, even 'emergent level' readers are able to visually track the text performance. In addition, SLS regularly incorporates a response activity, such as 'Cloze Readings', 'Content-questions' and 'sing-alongs' to increase viewer engagement in the activity. 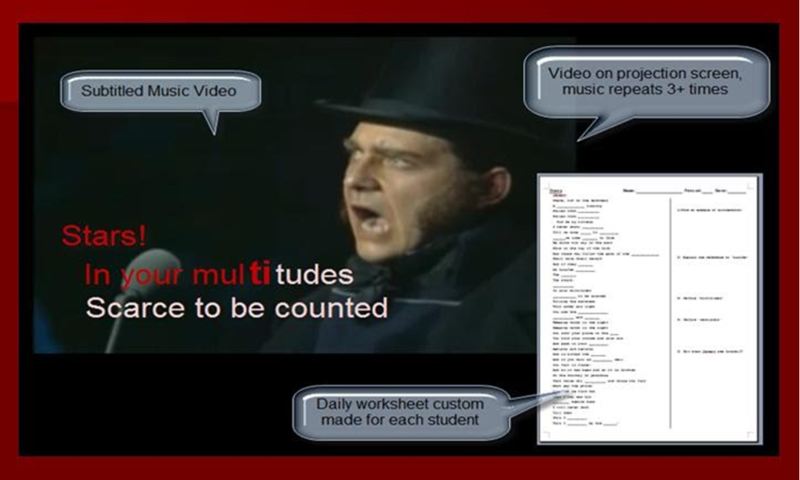 The following illustration shows the musical 'Les Miserables as projected on a classroom screen with the dynamic subtitling and a Cloze-Reading response activity. Illustration 1: Same-Language-Subtitling styled music video activity. SLS generally uses highly repetitive, dynamic audio/video resources such as music, poetry, audio-books, or famous speeches as the base resource. While music strongly reinforces SLS, any strong audio model can be used as a starting base. The ‘Musical Theatre’ genre provides some of the best resources for SLS activities and Musicals generally have a literary base or have story elements in common with novels and provide rich text resources. A teacher (or student) can find lyrics or texts to target any reading level and response activities can then be added to target specific reading skills. The activities can be used to teach phonics, to explicitly model language, to increase sight word recognition, to increase fluency, and to build on reading comprehension. From the basic SLS format, there are many possible accommodations and projects for students to explore. For a classroom activity, we combined captioned music videos with a response worksheet to create "group rehearsed reading exercises". Further, students can also compose their own SLS multi-media presentations and interact with subtitled media as a process. For this activity the student locates an audio source, creates and edits a script and using a word processing program plus video editing software then creates a unique SLS presentation. The hard work comes in as the student matches his visual script in content and in synchronization to the audio model. The SLS approach is innovative and provides multiple reading opportunities and benefits packed into a deceptively simple approach. Dr. Brij Kothari of Cornell University coined the term "Same-Language-Subtitling" in 1996 to describe his application of Karaoke-styled captioning. Kothari developed his SLS using Bollywood film songs on TV to promote literacy in India. His massive SLS study has received awards from the Tech Museum of Innovation (San Jose), Development Marketplace (World Bank) and the Institute for Social Inventions (London). His project has major financial support from the Google Foundation and the OLPC group has plans for incorporating his application into their educational package. Kothari is currently studying the impact of SLS on illiterate and emergent level readers. In his 2002 article “Same language subtitling: a butterfly for literacy, Kothari proposed using the SLS format to raise the literacy in India on a massive scale. In that paper, he documented his initial trials at a primary school, which was a two-phase study designed with a controlled pre- and post-test. The experiment was conducted over a three-month period at a rural Indian Public Primary School. Three groups of 46 were formed with an equal number of children from the fifth and sixth grades, and with the same male-female ratio. Student populations were primarily low-income. All students were pre-tested for mono-syllabic word recognition. Each group received 18 hours of class time with presenters following three different programs targeting vocabulary. The first group watched five subtitled Hindi film songs each session, three sessions a week. The second group viewed the same program without subtitles. The third group did directed reading activities. After three months, the same monosyllabic word recognition test was repeated. Group means were then compared statistically. The results demonstrated a significant improvement in phoneme acquisition for the SLS group. (Kothari et al, 2002). Given the strength of Kothari's research, one would expect to see a dramatic rise in research and use of this format in both the classroom settings and in public broadcasting. Ideally, there should be widespread karaoke-style-subtitling for all music based programs on TV, video and the web. However, that is not the case, and currently there is limited access to quality synchronized subtitling. Currently, most television and movie content is required by law to include ‘Closed-Captioning’, however music video is one of the exceptions and most music videos do not come with any form of subtitling. In contrast to MTV and music video, ‘DVD-Movie-Musicals’ generally include good quality Closed-Captioned subtitling (not karaoke level however) and can provide material for the basic SLS activities. While the technology has adapted at breakneck speed, educational research, application and usage has been slow to follow. Just a few years ago SLS as a process had few resources and was cost prohibitive for small-scale classroom use. Now, there are many computer programs available that give teachers and students the ability to compose their own Karaoke/SLS presentations. There are a number of concerns with using SLS in the classroom. First, Kothari’s early SLS research looked at school children in early reading stages; he did not explore usage of SLS as a classroom activity or usage of SLS with secondary students. Second, Kothari’s study was targeted at ‘emergent-level-readers’ not ‘struggling-to-functional-level-readers’. Third, there are few studies of SLS in application to English speakers learning to read English. Kothari's primary focus has been to expand the SLS application to India’s national television level to address widespread illiteracy in India. His study was not actually directed towards developing classroom applications of the technology or to addressing a wider range of disengaged readers. Forth, while Kothari’s study is showing good skill retention for both ‘functional’ and ‘literate-level-readers’, it is also showing limited results with ‘functional-level-readers’ for proficiency growth. This low impact on a wider level of struggling readers may simply be a function of Krashen’s hypothesis of language acquisition: that the input model needs be slightly above the student’s language level (Krashen, 1985:72-73). Kothari's SLS ‘input’ targets lower level readers, ergo his SLS impacts lower level readers. Finally, Kothari's study does not explore the possibilities of SLS and computer technology in the classroom where students can be an active part in creating SLS materials. This study examined whether the use of Same-Language-Subtitling (SLS) can be effective in a Secondary School Special Education English and Reading classroom. Can the simple addition of twenty minutes a day of subtitled Broadway Musicals and cloze-style worksheets really impact learning? Is it possible to incorporate this format without taking away from current reading programs? Can SLS be used equally well with a wide range of American High School Students? ​ Prior to this study, the team predicted that the SLS format would increase student engagement and that there would be a corresponding impact on reading growth. The study group believed that to demonstrate the wide scale efficacy of SLS that it was important to experiment with music that was outside of the students general experience range and with lyrics that were significantly higher than the groups’ instructional reading levels. The team agreed in advance to use the “Les Miserables in Concert” DVD and “Cats the Musical” DVD and “Big River –the Broadway Recording” CD and corresponding readings as the base materials for the intervention SLS activities. This provided text material that ranged between an 800 Lexile reading levels (5th to 6th-Grade Equivalency) to the 1200 Lexile level (12th G.E). Teachers in the control groups agreed to use or assign readings from corresponding resources. The team also wanted to include the students themselves in creating media for classroom use. Karafun (a free karaoke creation program) and several other editing programs were made available to teachers and students for creating and editing media. This study followed quantitative and qualitative research methodology. This consisted of documenting pre- and post-treatment reading assessments, observing classroom behaviors, monitoring classroom activities, and conducting student engagement surveys. A time monitoring sheet and an engagement rubric were developed and special education staff made random observations before the intervention and throughout the intervention period. For a baseline and comparative purposes, approximately 1200 students were tracked on multiple standardized reading assessments. Pre-and post implementation scores were tracked on Accelerated Reader’s STAR computerized reading assessment and compared to both annual Stanford Diagnostic Reading Test, Scholastic Reading Inventory (SRI), and to the Gates-McGinnity Reading Test. 203 Special Education Learning Disabled (LD) students were screened further and subjected to triangulation and validity checks on a comparison between two or more reading tests within a sixty-day period prior to the SLS intervention. Assessment data was examined to determine if the variance of scores predicted by the Pearson Product-Moment Correlation was greater than the actual variance. This screening and testing process identified 158 LD students to be used as the study group, 149 of whom make up the data group. These students had reading levels ranging between 2.2 G.E. and 9.4 G.E., and had an average reading level of 5.37-Grade Equivalency (GE). Further, the data group averaged a .24 GE gain on reading scores during the previous school year. Students from this group were randomly placed into five possible settings over twenty classes. This resulted in 51 students being placed in the SLS intervention group and 98 LD students in other special education or regular education classes. This also resulted in an additional 14 students in SLS group and 26 students in control groups for whom pre/post test data did not pass validity checks or was not available. The data for this group was examined, and as predicted, the likely false low data would have inflated gains for all groups. Further, it should be noted that reliability testing was not done for non-special education populations (General Education Students); however, for comparison purposes, full school data was gathered on all students. As much as possible, for the initial study the control group classes had similar ranges of students. Reading levels in all classes ranged between second-grade equivalencies to above ninth-grade equivalencies. Student ages ranged between fourteen and nineteen. For the most part, at the beginning of this study the majority of these students would be considered novices with limited exposure to technology. While the mastery of computer technology was not the main focus of this study, it should be noted that the secondary SLS activity can be technologically intensive. To balance this, within the control-groups one of the teachers also made extensive use of technology for research and writing assignments. The intervention portion of this research project documented the addition of two types of SLS music exercises: first, engaging in SLS viewing/response activities; and second, engaging in creating SLS/Karafun projects. (2) while watching: completed cloze-style worksheets (Lyrics with blanks based on a pattern, such as type of word, related vocabulary, alliterations, etc. ), this response sheet also included short responses to comprehension questions. The entire activity took less than 20 minutes per day. The source materials for this activity came from three popular story-musicals containing lyrics well above students’ instructional reading levels and were paired with class reading activities: Les Miserables with Hugo's novel, ‘Cats’ with ‘Old Possum’s Book of Practical Cats’, 'Big River' with Huckleberry Finn. The activity included simple cloze worksheets and echo reading sing-a-longs. The idea was to promote the active tracking of the subtitling. Exercise was targeted to support reading strategies, story elements and vocabulary from related reading assignments. The materials for the first eight weeks of intervention were primarily straight from the DVD or teacher generated Karafun media, and provided a model for later student composed SLS presentations. During the last six weeks of the intervention period, for the secondary SLS activity, students produced subtitled multi-media files from the ‘Big River’ CD during Lab (study hall time periods). This activity took a minimum of 90 minutes per week for initial projects. One of the indicators for engagement was the additional time students voluntarily devoted to their multimedia projects. This activity primarily used ‘Karafun’ (a free karaoke production program), and Microsoft Word and PowerPoint programs. These activities centered on creating and manipulating subtitling with audio and visual files. This activity started with students producing Karaoke versions of their favorite songs and quickly progressed to work products for group SLS. (5) make engagement worksheet or vocabulary activities. Steps one and three were the most time and labor intensive, since these steps required the students to listen to audio multiple times and to create, match and synchronize texts to the audio file. These projects were then incorporated into the classroom SLS presentation activity. The primary goal of this study was to determine if the addition of Same-Language-Subtitled (SLS) music lyrics as a supplementary reading activity could positively impact the problem of low reading growth in a high school special education English classroom. A time monitoring sheet and an engagement rubric were developed and random observations were made before the intervention and throughout the intervention period. For control and comparison purposes use of reading activities and use of video were carefully documented, and the detailed time monitoring records can be viewed at www.sls4reading.com. The following table (Table 1) provides a summarized analysis of the average number of minutes per week for various classroom activities. Table 1: Averaged minutes per week on various classroom activities (summarized), previous 12 weeks to intervention compared to weeks 9 through 12 of SLS intervention activity. For the SLS Groups during this time period the average weekly reading times went from 95 to 105 minutes per week. Based on this observation for the intervention model, the SLS activity did not take any time away from classroom reading activities, and indeed the SLS group teacher was able to slowly increase time students spent in reading activities. Further, if the SLS activity is added to reading activities (105 plus 90), the total reading activities increased to 195 minutes per week or from 29% to 60% of class time available. A review of the detailed data sheet shows that the SLS activity came primarily from classroom management and lecture time. On the subject of 'time-spent-reading' there are some differences between groups in types of reading activities and amount of time spent reading; however, there is not a major difference in total reading times over the course of the study within the control groups. This sets the basis of the experiment, while there is very little change in reading times there should also have been little change in rate of reading growth. Table 2: Observations on SLS Group - Engaged Reading Rubric and Use of Video/SLS Activity. This study anticipated that the addition of classroom SLS activities would correspond with an increased engagement in other classroom reading tasks. This second goal (increased engagement in reading tasks) was met as evaluated by qualitative observation rubrics conducted by SPED staff. The observations were taken weekly on a random basis during reading tasks (Sustained Silent Reading, Directed Reading, etc,) and during the SLS activities. Another interesting result of study methodology: a careful review of comparison groups shows there was some shift to using Captioning and/or response activities with video. However, when testing data was reviewed there is no indication that the increased usage of subtitled video within the control groups had any statistical impact on reading proficiency growth within control groups. This would indicate that subtitling on its own has significantly less impact compared to SLS (the addition of music, repetition, and response worksheets). Table 3: Change in Scaled Scores on Standardized Reading Assessments for two SLS Intervention groups (SLS Group -51 students and Non-Validated -14 students) compared to two Non-SLS groups (Non-SLS LD -96 students in Special Education English classrooms and Non-SLS LD Special Education students in General Education English classrooms - 6 students). The previous chart (Table 3) summarizes reading assessment data. 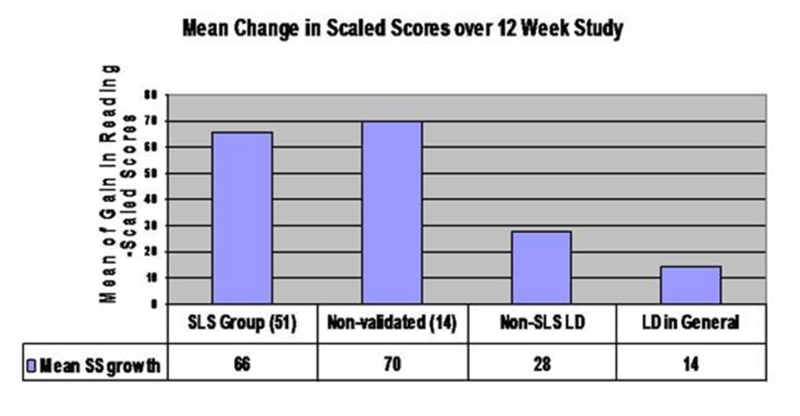 The SLS intervention group showed marked improvement in reading; a gain of an average of SS 66 points, or GE 0.7, or more than 25 weeks growth in a 12 week period. In (Table 3), for comparisons purposes, data is included from students [Non-validated (14)] that participated in SLS group. These are students whose pre/post-test data failed the reliability checks. As predicted, the [Non-validated (14)] group tested showing higher growth patterns and including their data in either the SLS or control groups would have inflated growth scores. When data from full school population (1000+ students) and LD control groups was reviewed there were a number of patterns that can be identified for comparison purposes. 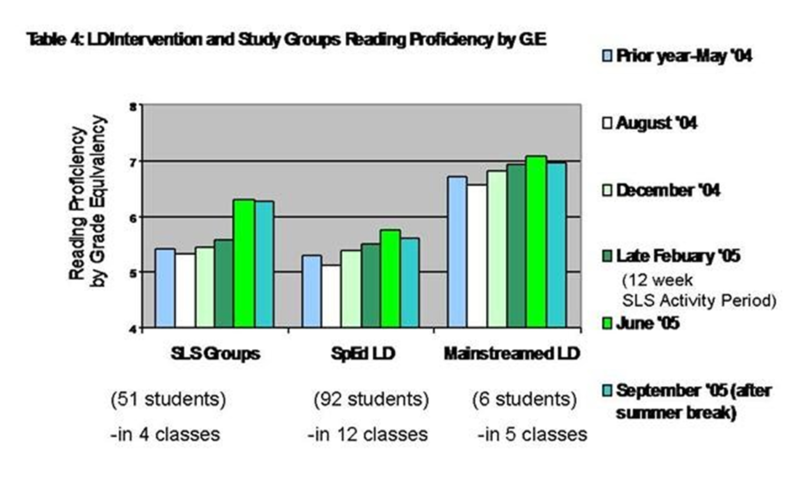 First, if reading levels are compared across multiple years, typical grade equivalency gain can be readily identified for both the general school population and for subgroups: previous to this study average growth for LD students was .24GE, and average growth for general education students was .41G.E. Second, there is some real loss that happens over the summer breaks. After screening assessments to eliminate false low tests at the beginning of the school; previous to this study the average loss for LD student was GE 0.12, and for general education students the average loss was GE 0.062. Table 4: Chart of SLS Intervention Group and Control Groups Reading Proficiency Growth from May 2004 to September 2005. The previous chart (Table 4) illustrates reading growth over an 18 month period (One year prior to three months after) for: the intervention group, other Special Education English classrooms and mainstreamed LD students-- as evaluated by STAR, SRI and the SDRT. Here, visually it is much easier to recognize the typical .24GE growth pattern for the LD population and the losses over summer break. In comparison to LD control groups the SLS group made higher average gains (GE 0.73) compared to (GE .25) for other special education classes and (GE 0.15) gain for mainstreamed LD students. Based on annual testing the SLS group made a (GE 0.77) gain over the 2004-5 school year. Significantly, the SLS group lost only GE 0.02 over the summer intercession; and three months after the initial study the SLS group had retained a much higher portion of their gains than either the control groups or general education students. Over the following three years (2005-2008), many of the SLS students continued on with an SLS lab class. For this time period, the SLS groups were not randomly placed and there were many students who took the SLS class over multiple years, for this reason it becomes much more difficult to make a valid comparison between SLS group and other groups. Still, school-wide student assessments were revisited annually and data was examined to verify ongoing group performance. As in the intervention portion of the study, for the SLS group pre-and post-testing and revisited data is only included where data passed a validity check. For other comparative groups, no attempt was made to eliminate false low pre-test data. This may result in slightly inflated growth in non-SLS LD and general education scores. (Table 5) below presents data from the SLS group, the special education students, and the general education high school students from 2005 to 2008. Table 5: Reading Gains 2004/5 thru 2007/8. This table presents reading proficiency growth data for SLS groups, Special Education LD students, and general education students. This study intended to address several concerns with SLS: verifying its impact on reading growth over a wide range of reading ability, increasing engaged behaviors, and developing classroom activities and accommodations. First observation: the majority of students in ongoing SLS groups experienced at least a two-year gain in proficiency levels, and that gain continued for students in subsequent years. Second, the gains in SLS held even when students moved on to other academic placements. Third, the students who participated in SLS had a higher chance of becoming proficient readers when compared to struggling readers who were not exposed to SLS. The basic goal of raising reading levels over a broad range of reading proficiency levels was met. The small gains in focused reading-times in the SLS group may indicate that through the SLS activity students increased their ability to stay on task during related activities, but is not enough to have directly impacted reading growth without allowing that SLS exercises also had a major influence on reading growth. The results of this classroom application of SLS are very similar to the results of Kothari's study in India. We can conclude that SLS is a simple powerful tool with enormous potential to impact reading. There is strong evidence that as part of classroom activities SLS can support reading growth for both struggling readers and for near-proficient readers. In addition, there is significant evidence that as the central classroom activity SLS can promote reading and increase engaged reading behaviors. While the qualitative survey data is not presented in this paper, the ongoing data collection and SLS projects and applications can be viewed online at www.sls4reading.com. Overall the qualitative data indicates that the students enjoyed these activities and the SLS format using the Broadway Musicals promoted increased focus in reading activities. Significantly, most research on struggling readers indicates that the amount of time a student spends in reading-related activities (sheer reading volume, how much a child will read in and out of school) has a major impact on reading rate, fluency, and academic growth. SLS used in this study appears to have served the function of dramatically increasing time and engagement with language and reading. In addition, studies have shown that people with even just a mild reading impairment do not read for fun, and that attitude to reading activities can also have a major impact (Cunningham & Stanovich, 1998a; Cunningham & Stanovich, 1998b). Same-Language-Subtitling has the potential to address these concerns. SLS as a reading and presentation format can have a significant impact on student focus and attitude. Given the results of this study's SLS application and in light of the results of Kothari’s research: there should be much more experimentation and usage of Subtitled Media within the American educational system. Generally there should be much more availability of SLS style captioning on video, television, and the web in the near future. There are already a number of commercial SLS type products already being developed. Karry-A-Tune Technologies has both a "Karaoke for Reading" and a "Learn to Sing" product being studied in Florida. There are also commercial audio-text books being used in many elementary schools. The range of these products tend to be targeted to very young children and there is a great range in quality of audio, human voice versus computer generated reading voices, all of which creates many opportunities for further educational research. 1) The basic SLS activity can be done fairly simply with readily available DVD musicals and worksheets; however, dynamic (sing-a-long style) subtitles seem to work best. comparable to novels. Over the course of three years 'Evita', 'My Fair Lady', and 'Music Man' have also worked well. While music seems to work best, the students responded well to both poetry and to famous rhetoric; try Martin Luther King’s “I Have a Dream”, and Poe’s "The Raven". 4) Keep the students actively engaged in SLS activity. Always use a response worksheet, and teach students strategies for tracking subtitling. This can range from filling in simple phonics-level cloze worksheets, to rewriting or translating musical scenes into contemporary stage dialogue, to performing sing-a-longs. school. Reading Research Quarterly, 23, 285-303. Cunningham, A. E., &. Stanovich, K. E., (1998a). What Reading Does for the Mind. The American Educator, (Spring/Summer): 8–15. American Federation of Teachers. Cunningham, A. E., & Stanovich, K. E. (1998b) Print Exposure In Word Recognition in Beginning Reading, edited by J. L. Metsala & L. C. Ehri. Mahwah, NJ: Lawrence Erlbaum: pg. 235–262. Foorman, B., (2004). Screening for Secondary Intervention. The Center for Academic and Reading Skills, University of Texas Health Science Center at Houston. Goldman, M., & Goldman, S., (1988). Reading with Closed Captioned TV. Journal of Reading, 31(5), 458. Kothari, B., et al, (2001). The Proof is in Improved Reading: Same Language Subtitling on Television in India, IIMA Working Paper No. 2001-07-04. Kothari, B. & Takeda, J., (2000). Same language subtitling for literacy: small change for colossal gains. Information and Communication Technology in Development, S. C. Bhatnagar and R. Schware (eds). New Delhi: Sage Publications, pp. 176-186. Leinhardt, G. (1985). Instructional time: A winged chariot? In C. Fisher & D. Berliner (Eds. ), Perspectives on instructional time. White Plains, NY: Longman. McCall, W. (2008). Same-Language-Subtitling and Karaoke: The Use of Subtitled Music as a Reading Activity in a High School Special Education Classroom. In K. McFerrin et al. (Eds. ), Proceedings of Society for Information Technology and Teacher Education International Conference 2008 (pp. 1190-1195). Chesapeake, VA: AACE. Sousa, D. (2004). How the Brain Learns to Read. 118-125 L.A.: Corwin Press. Wagner, M.J. & Brick, J.S. (1993). Using Karaoke in the Classroom, Music Educators Journal, Vol. 79, No. 7, pp. 44-46. Williams, H. & Thorne, D. (2000) The Value of Teletext Subtitling as a Medium for Language Learning. Department of Welsh, University of Wales Lampeter, Lampeter, Ceredigion SA48 7ED, UK Sys., v28 n2 p217-28. McCall, W.G. & Craig, C. (2009). Same-Language-Subtitling (SLS): Using Subtitled Music Video for Reading Growth. In Proceedings of World Conference on Educational Multimedia, Hypermedia and Telecommunications 2009 (pp. 3983-3992). Chesapeake, VA: AACE.